Le'Or T'Nanshi is the capitol of the elven nation of T'Nanshi proper. The administration of the entire nation is controlled from this location. However, as a rule, the elves rule things very loosely and only as much as needed. Le'Or T'Nanshi and the Nation of T'Nanshi are ruled by the same body of elected officials. The Council of Nine controls all foreign policy and domestic matters. Members are elected to the Council of Nine via elections held every fifty years. The Council of Nine passes laws, as few as possible, that are enforced within Le'Or T'Nanshi by the Watchmen. The remainder of the nation gets its laws enforced by the T'Nanshi army. Both the Watchmen and the T'Nanshi army are separate entities controlled by the council. Both the Watchmen and the army each have a supreme commander in chief that is a member of the council. They are the only ones on the governing body with a specific task to look after. The rest of the members act in consultation with each other on all other matters. Although it is not a law, it often happens that only Nobles can get elected to the Council of Nine. This is not seen as a problem by the elves, for most common elves have absolutely no interest in politics or governing, and they have little intention of catching the eye of the government. Noble families in T'Nanshi are not the same as in a typical human nation. Nobility is not equated with land ownership or money in elven society. For the elves, a noble family is simply a family who has played a big part in the history of the elves at some point in time. When a family earns a distinction to set it apart from the normal elven families, it is considered noble. It just so happens, that most of these families also have successful business dealings that have made them wealthy, but it is not true of all the noble families. The commander in chief of the Watchmen is a man named Ryiel Sunmar. His family is also of noble descent, although they take their lineage from the newer Sunmar family and its founder, Orleron Sunmar. Ryiel is Orleron's half-brother. T'Nanshi is a largely self-sufficient nation. They have no need to import food or large quantities of raw materials, except for metals and stone. The nation's major exports are timber, herbs (particularly glowmoss), luxury goods, and food. T'Nanshi currently exports significant amounts of food aid to M'Chek under the terms of the peace treaty between the two nations. The Great Western Road, which runs from Nanshi Urbaz south to the chasm created by the M'Chek / T'Nanshi war. This once ran all the way to Southhill in M'Chek but that road is barred now, and trade turns east at the crossroads of the Western and Southern Roads. The Great Southern Road runs from somewhere in Western T'Nanshi, where it used to go all the way to the Eridanus River and a coastal port now destroyed by the Forest of Midnight, all the way to Nireth on the eastern coast. The Northern Route runs from Nanshi Urbaz eastwards along the Deglos border to about the center of the nation, where it turns south for the Foot of Le'Or and continues generally southeast until it reaches Ft. Taunton in the Blandenberg Protectorate. Smaller paths go further east to Quithranos (known as Fishhaven in the common tongue). The major overland route to southern markets now begins at the crossroads over Orcscourge Chasm and links the Great Southern Road to Blandenberg, and then to M'Chek. Nireth's major seaport functions as the 4th route, linking Mikona and Eastshore to Grantir and northern Negaria. Currently this route is impeded by a Drotid blockade of the port. T'Nanshi has significant trade relationships with Deglos via Nanshi Urbaz, with provinces of the Kurathene Empire via Nireth, and with Elysia via a westerly spur of the Great Western Road. It maintains minimal trade with Toran Shaarda via the outpost and small docks at Renethae, but this is mostly a military location. Also significant to the economy is the farming community of Summerleaf in the canopies near the lift at Kharak Thayt, and the light industrial center at Silverfall, also in the canopies. Artisans and artificers gravitate to Le'Or, and finely crafted items created by the artisans are shipped throughout Negaria. This district centers around a group of trees connected to a couple of winches that control lifts used to get into the city. It is usually heavily guarded, and all non-elven visitors are noted. This is the heart of the entire elven economy in T'Nanshi. Goods from all over Avlis are brought into this market from as far as the nation of Tydedu. Exports are also fairly rigorous here. There are two kinds of merchants to be found: elven domestic merchants, and (usually) non-elven foreign merchants. The domestic merchants are selling items for export, and the foreign merchants often have goods from elsewhere. Fallkirk Enterprises, Inc. maintains a transport portal here, making Visimontium only a step (and a few hundred gold pieces) away. Le'Or T'Nanshi's prime location makes it a major trade artery for getting goods to the south part of the continent. This is the spiritual and legislative heart of T'Nanshi. It contains the Capitol Building, where the Council of Nine meets for sessions and makes decisions for ruling the nation. It also houses the High Temple of Dru'El, which is the main holy site for all who follow that god. It is said in legend that the ground beneath the trees of the temple once held the prison that contained Dru'El as a mortal before he escaped to godhood. Aside from Dru'El's temple, there are temples to Gorethar, Dra'Nar, and Pelar, as well as shrines to Cha'reth, Mishlekh, Berryn, and Dagath. Healing and resurrections are easily found here. All the normal, non-noble, folk live here. All undistinguished elven tradesmen and workers make their homes here if they wish to live within the city. Many elves decide to live outside the city so they can more easily ply their harvesting trades, but craftsmen often choose to live inside. The Nobles district contains the houses of the distinguished elven families who choose to live within the capitol. The district, and the houses within, are quite large. This is a military base. In fact, it is the central military base for entire elven army. Commanding officers and generals are common here, as most of the plans for the war with M'Chek started within the base's walls. The largest port city in T'Nanshi (and the largest city on the forest floor) is Nireth, on the east coast. This is a major trading hub for M'Chek, Grantir, and points north. The nearby mine generates great wealth for daring and enterprising prospectors and fuels a thriving business district that features the AAAA's Nireth Collection Center. Nireth is the seat of the High Priest of Dru'El in Eastern T'Nanshi, and the though Temple to Dru'El is smaller than Cornath'Dru'El in the west, it is the largest constructed on the forest floor. Currently, Nireth is experiencing a severe blockade by Drotid warships, decimating the export trade as well as impeding M'Chekian economic interests along the eastern coast and even into Mikona. 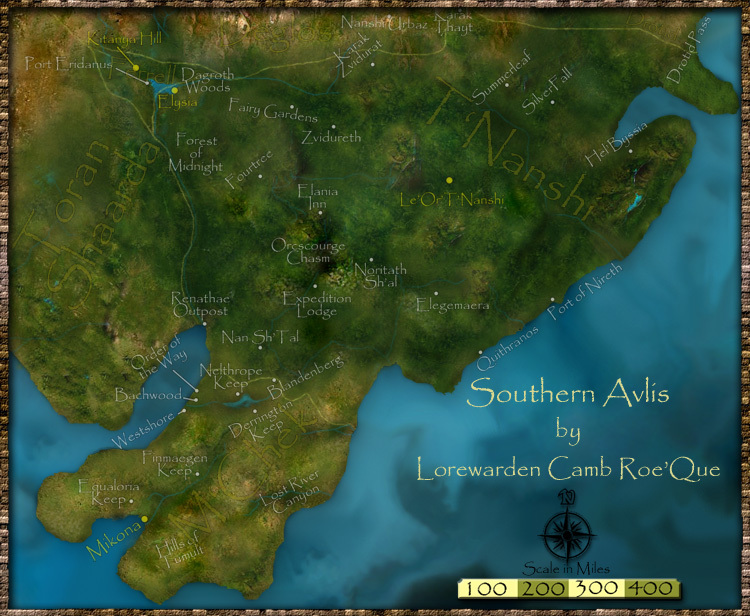 The 2nd largest city on the forest floor is Zvidureth in the northwest, situated along the Great Western Road. Among other things, Zvidureth does a great trade in exports of T'Nanshi Glowmoss. Featuring an eclectic open-air market and a unique pack-bear rental service, this trading city is perfectly situated just south of a major crossroads. With Elysia and Kharak Zvidurat both short distances to the west and north, a diverse mix of residents and travellers can always be found here. Just off the Great Western Road, The Leaping Stag is said to be the busiest tavern on the T'Nanshi forest floor. Cornath Dru'El is a short distance to the west, and the nation's only Temple of Cha'reth overlooks the town from a high bluff to the east. Known to humans as Fishhaven, this town has seen better days. Once a significant fishing and trading city, the ravages of the M'Chek/T'Nanshi War severely reduced its economic influence. Several years later, the town was raided by the Bonds of Evrak, and fully half the citizens were forced to tie heavy stones around their necks before being driven into the sea. Le'Nofaythen's elite 6th Division, along with elements of the Southern Division rescued the town, but it has never recovered fully from the massacre. Rumors claim the spirits of Quithranos dead rise with the mist in the harbor, and it is difficult to find a family unscarred by the Evrakian atrocity. In recent years, Quithranos has become the site of Le'Nofaythen's basic training camp, and the brightest prospects are often selected for an elite unit of Arcane Archers based in the town. With fishing boats almost permanently out of action there's little work for locals, and the increased presence of Le'Nofaythen recruits has fueled an industry revolving around prostitution and gambling. Located in the northwestern canopies above the lift at Karak Thayt, Summerleaf is an idyllic farming community with a small market. Boji the Weaponsmith is a local mainstay of the marketplace, boasting rare and obscure weaponry from unknown lands. Famous for its Summerleaf Stuffed Mushrooms and flaming-hot T'Nanshi Chili, this village offers a welcome respite from the danger of the forest floor. Numerous other plants are grown at the farms, some of them found only in Summerleaf. Known as Fourtree to humans, this sleepy village on the canopy road between Summerleaf and Le'Or gets its name from the quartet of massive etzethen surrounding the public square. Nanshin here lead a quiet life with very little contact with the world... or even their brethren on the forest floor. Locations of interest include a large Temple to Dra'Nar with an orphanage and a Cha'rethite hospital, Secondhand Celestial (a magical curiosity shop), and Vara'eths, an exclusive bookstore with a wildly varied selection and a proprietor famous for refusing to speak common. Server Information: This server entails not only the city of Le'Or T'Nanshi but the entire "Canopies" area of T'Nanshi. 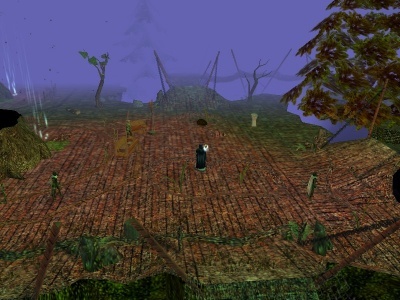 In-game, the Canopies are the walkways and villages that are supported by the trees of the forest itself, high above the forest floor. The Canopies cover the same amount of area that the lands of T'Nanshi do on the Wilderness Server. Please check the Wilderness Server page for information about these locations. A small section of the nation of Deglos is also found on this server. This page was last edited on 6 January 2011, at 19:23.